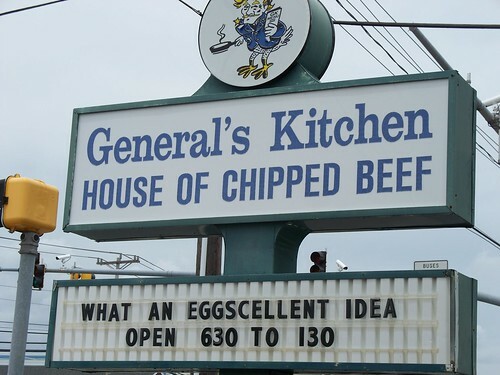 At The General’s Kitchen: House of Chipped Beef, the house specialty is—as the name hints—a dish called Creamed Chipped Beef, which sounds about as terrifying as it actually is, and slightly less terrifying than it actually looks. It comes on a white plate, accompanied by either grits or hash browns, but you will hardly notice them when it arrives, because it is the other pile—the chipped beef pile—that will draw your attention and refuse to let it go. It’s hard to describe. The cream mentioned above is not quite cream. It is probably some combination of Bisquick and dairy, fried with a small mountain of chipped beef and served over biscuits or toast. If you get it on biscuits, like I did, it is sort of like eating a biscuit on a biscuit. It is salty and meaty and biscuit-y and remotely delicious, and I add the qualifier only because, at some point, it stops being delicious and just starts being excessive. I repeat: Your $7.50 will buy you a small mountain of it. Let’s just say that if I had a cholesterol check scheduled any time this week, I would reschedule. But really, any pretenses about health should be checked at the door of the The General’s Kitchen. That’s not the point. This is throwback dining at its finest. The carpet is filthy and the walls are covered in fire fighter memorabilia and a vast array of baseball caps. The General himself passed away several years ago and now his wife now walks around the dining room during the breakfast shift, checking on patrons, unsmiling in a velour track suit. Our waitress, however, was quick to take our orders and to refill our coffee. It’s worth mentioning that several members of our party opted for another breakfast option: the chipped beef omelet, in which creamed chipped beef is both spread out over the top of an enormous omelet and inside it, for double your beefy, creamy pleasure. In that case, your biscuit or grits comes on the side. Macky’s is our second choice, but it becomes our first choice once we get inside. The other bar, Seacrets—which, I’m sorry, sounds more like an oceanside adult entertainment complex—teems at 4 in the afternoon with dudes who are draped in gold and peeling from their spring tans, the bikini clad girls on their arms universally and uniformly tramp stamped, like cattle. I had been concerned about the bouncers letting us in with sandals instead of proper shoes. I need not have worried. So. Next bar. Macky’s is the choice because Colin knows someone who works there, but in reality, Colin and Candice know someone who works in every single bar in Ocean City, Maryland, and about half the patrons, too. Alas, something I experience only rarely: Travel with locals. The bar’s back wall is open to the ocean and tables spill out onto the sand. Inside, the high ceiling is hung with bowling trophies Ocean City ephemera, and TV screens. Potted palms abound. The crowd is pleasantly all over the map—families with sticky-fingered little kids, couples drinking pre-dinner Coronas, rowdy packs of twentysomethings, senior citizens watching the game. Macky’s don’t serve Maryland’s most famous dish–blue crabs–but the TV screens encourage you to “Embrace the All-Carb Diet” with a pasta dish and to try their grilled shrimp. Food, however, was not our mission. That would come later. But we did order creamy/icy margaritas and the house specialty—an enormous cocktail called an Orange Crush, which is served in a sand pail with five straws and a plastic shovel. Having tried other macro cocktails—enthusiastic and brain-wrecking drinks served in fish bowls, etc.–let’s just say that this one, like most, is more about quantity than quality and appeals to a specific crowd. Like, the one I was with, for example. For future reference, it also comes in grape. They played the soundtrack from my senior year of high school—Chumbawumba, Third Eye Blind, Weezer—and we drank as the sun set, as the day-to-evening crowd shift began, as summer inched closer. And then we went for crabs, because that’s what you do in Ocean City, Maryland at the beginning of summer. We choose Higgins. Having grown up on lobster and steamers, I come prepared for a mess, but I am still a little surprised when a bus boy arrives and promptly tapes sheets of brown paper to the table in front of us. The air is humid, the sun disappeared. 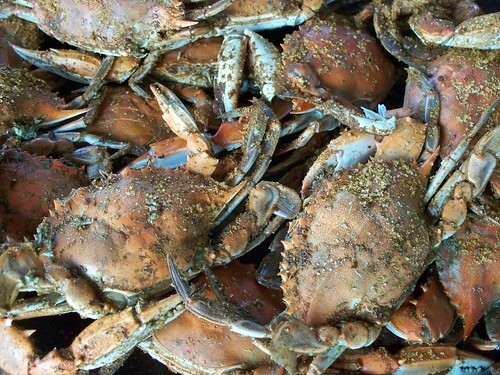 We’re famished, so we all order the same thing—the Number 1—which includes all-you-can-eat blue crabs, fried chicken, corn on the cob, crab soup, cole slaw, and french fries. Other options include Alaska king crab legs instead of blue crabs, baby back ribs, shrimp, or all of the above, together or separately. The Number 1 costs about $25. ctly on the table along with an assortment of little tools—a pointed knife, a small plastic cracker that looks nothing like the stainless steel lobster crackers of my youth, a fork, and (my favorite) a wooden mallet. She also gives us tubs of vinegar, melted butter and Old Bay seasoning, a mixture of salt, paprika, and chile powder. The crabs are a little bigger than a hand, their backs steamed an angry orange, Old Bay sticking to their claws. The mountain of them is gorgeous, a chaotic tangle. Candice gives the lesson. She picks up a crab and flips it over. She aims the point of her knife under a narrow piece of the shell in the center. She shows us how to split the body, clean out the gills and goop on the inside, hit the claws with the mallet. It is about four thousand times more work than opening up a lobster, and for a third of the meat. After much cracking, splitting, prodding, and picking, we all realize that we haven’t looked up from the table in twenty minutes. Our beers sit mostly untouched. The crabs are delicious and, amazingly, so is the corn. Usually corn served in roasdside seafood joints—again, I speak from experience—is wrinkly and flavorless. It is simply not a priority with all that incredible seafood around. This corn is truly amazing—golden and sweet and perfectly cooked. If only we had room for more of it with all of our crabs. I lose count of how many I’ve eaten after an hour—maybe 6? By then, my hands are filthy, my lap full of shell fragments. We unwind paper towels from the roll two and three sheets at a time. The bus boys clear the trash buckets on our table every ten minutes. We make a colossal mess. By the time we’re done, the paper in front of us is soaked through, strewn with bits of shell and meat. It looks as though dinner exploded. We will smell like crabs for hours. No one seems to mind very much.